The second theme featured on the Picture Book Month calendar is those pesky rascally rabbits or bunnies, whatever you’d like to call them. I’m trying to keep pace with the calendar and blog about either the person or the theme featured each day of this month on the calendar. Some days I might even be able to do both! I’m taking this opportunity to post a story time I did for some kids up to two years of age, although I take no credit for the rhymes featured here. That’s all someone else, I just paired them up. And pulling them out of bed. The first theme featured on the Picture Book Month calendar is Ocean. I’m trying to keep pace with the calendar and blog about either the person or the theme featured each day of this month on the calendar. Some days, like today, I might even be able to do both! I’m taking this opportunity to post a story time I did for some kids up to two years of age, although I take no credit for the rhymes featured here. That’s all someone else, I just paired them up. The Waves on the sea go up and down. What do you use for your ocean themed story times? Do you go pirates, or have you ever done one with just water as the theme? ARRRRRRRRR me matey! Today is International Talk Like a Pirate Day! Never heard of it? Where is your pirate spirit? It’s an excuse to celebrate all things pirate, and a great theme for story times that will draw the sprogs (errr… I mean boys and girls) into the library. And I be speaking the truth, seeing as how my two pirate story times this week drew over 60 people each. So, what do you do at a pirate story time? Here’s the outline that I followed, along with some other idears for you lilly-livered landlubber. While this is probably the longest and most detailed of the three stories I did, it’s also the most fun for older preschoolers. 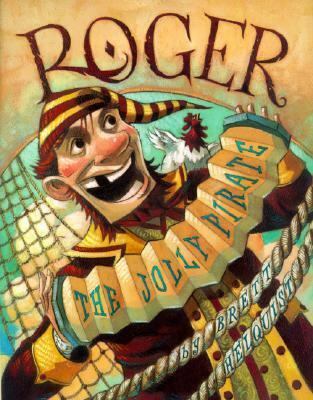 They feel smarter than poor Roger the Jolly Pirate as he tries to bake a cake in a cannon during a fight above deck. His misadventures end of saving the day as the cannon cake propels him through the air, shrieking and covered in flour, causing the Admiral and his men to think the pirate ship is haunted and abandon ship. The satisfaction on their faces for guessing the outcome is priceless. It also is a cool por-qua story for how the Jolly Roger flag came about and got its name, and considering the Jolly Roger flag is seen in the next couple stories, it’s a nice beginning. I interrupted the story with my own explanations about what was going on when I felt the vocabulary was over their head. For instance, especially when it talked about Roger not knowing the leeward from the starboard or the mizzen from the mast, I just added that those were all “parts of a ship”. Otherwise, a great read with a clandestine moral of everyone is able to help or do something in some way. I stumbled across this one quite by accident, and instantly fell in love with it due to its simplicity. 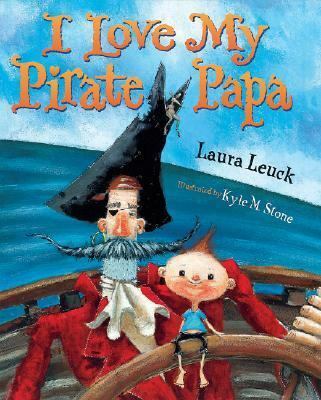 Most pirate books have a lot of text, but this one, with its rhyming narration and clear pictures make it perfect for younger audiences. 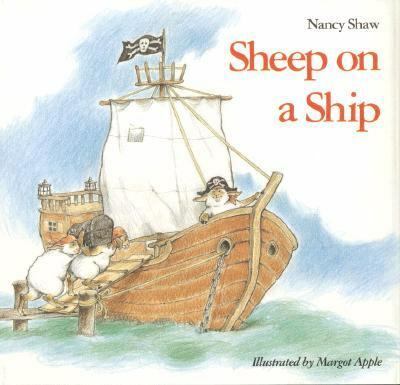 Nothing in the text suggests pirates, but the additions in Margot Apple’s pictures of a Jolly Roger and bandanas on each sheep make it obvious that they are pirates instead of, for instance, navy seamen. The newest of the three books, I chose this one because it again it was in rhyme, which in my experience seems to capture kids attentions just a little better than longer text. It also gave a nice overview of what pirates do, such as digging for treasure. And it gave all the kids a chance to consider pirates as parents, instead of just scary grown-ups. It painted a positive picture of pirates. Then we did it a second time, starting from the crouched down position, so that we ended standing up again. It was a lot of fun, and even some parents got involved. We also did “There Was a Pirate had a bird and Polly was his name-o”, obviously to the tune of Bingo. I had a parrot puppet on one hand, so when clapping out the letters, I lifted up and slapped my knee with the other hand, which worked pretty well, and kind of gave me the look of a one-legged pirate possibly dancing a reel. Finally, I did the song “The Waves on the Sea”, which is to the tune “The Wheels on the Bus”. Each verse has an accompanying action. More fun rhymes are available online by searching “Pirate story time”. One site I especially like is Born Librarian’s list of rhymes, and I wish I’d had time to incorporate some of them. I had several craft opportunities for the kids after the stories and rhymes were done. Make a spyglass by gluing a piece of black construction paper to a paper towel roll. It works better if you apply the glue to one end of the paper, start rolling, and then put some glue on the remainder of the paper. Make a toilet paper parrot. The instructions are right here, and are extremely easy to make. I pre-cut the feathers and the rectangles that served as the body, and provided googly eyes. Only one parent/child missed the beak and decided to make their own, so I don’t think the beak is necessary. The template for a whole sheet of pirate eye patches are available here. Again, I pre-cut them all out, and the provided hole punchers and scissors to cut the thread to the right size. We had some leftover cut up black plastic table cloths from a program over the summer. I printed off a skull and crossbones picture on white paper, and had the attendees glue a printout to the plastic table cloths to make a pirate flag to take home. We made tri-corner hats out of construction paper. Cut three pieces of paper into identical shapes and then staple them together into a triangle, leaving the middle open in order to slide on your head. This site provides an example, but what I did was made the sides shorter and had them curve upward and meet in the middle, so each strip looked like it had a hill. If this doesn’t sound right, picture those very simple/generic car drawings without the wheels, and you’ve got the general shape we made. And of course, you have to remember to dress the part. Striped stockings or tights, goucho “pants”, a striped shirt or a white ruffled shirt, and maybe a vest or sash will make you look the part. Don’t forget the bandana, earring, and maybe even a hook or sword. There are obviously quite a few other pirate stories and crafts available. What have you used successfully in the past? This Friday Feature post concludes my process of posting all the questions that I developed for a set of book discussions based on the Harry Potter book series. Today, I’m featuring Harry Potter and the Deathly Hallows, the seventh and final book in the series. This was the final book discussion, and also the smallest group, with only 15 youth participating in the discussion. That was actually a good thing, as it allowed everyone more time to discuss. Since the movie had been released in theatres by the time we hosted this discussion group, I had to stress to the participants that we were focussing on the book, and NOT the movie. Even still, several participants got sidetracked. For the most part, I think all the discussions went well, and the kids proved they had great memories and provided insightful feedback. 1. Were you surprised that Dudley told Harry “I don’t think you’re a waste of space.” Then he hugged him? How do you think Dudley felt about Harry? Do you think his parents influenced his opinion of his cousin? Why do you think Harry’s aunt and uncle disliked him so much? Do you think Harry was sad to leave? 2. Why do you think Harry is so against the plan to leave his house? Harry says “If you think I’m going to let six people risk their lives …” and Ron sarcastically responds “because it’s the first time for all of us.” (48-49) How do you think Harry feels about putting so many people’s lives in danger? Do you think his friends would be so willing to risk their lives if they were the only ones? 3. This book does not follow the format of the other books because Harry spends most of his time away from Hogwarts. Did you like this new way of presenting the story, or did you want to see what Harry did at Hogwarts after the Death Eaters took over? 4. How does the death of Dobby affect Harry? What was your reaction? Do you think he needed to die? Were you surprised by Kreecher’s actions at the end of the book? 5. Do you think Umbridge is willingly or knowingly working for the Death Eaters at the Ministry? Were you surprised that the Death Eaters were so successful in taking over so many places so quickly? Would you have resisted, and if so how? 6. Dumbledore has his own motives for being angry at Muggles, considering his sister’s resulting insanity. Are his reasons better or worse than Voldemort’s reasons for disliking Muggles? What happened to change Dumbledore’s impression of them? 7. Harry disagrees with Dumbledore when he says “I had proven, as a very young man, that power was my weakness and my temptation. It is a curious thing, Harry, but perhaps those who are best suited to power are those who have never sought it. Those who, like you, have leadership thrust upon them, and take up the mantle because they must, and find to their own surprise that they wear it well.” (718) What are your reactions to this quote? Do you think Dumbledore is true? Do you think he’s being too hard on himself? Do you think Harry was a good leader? 8. 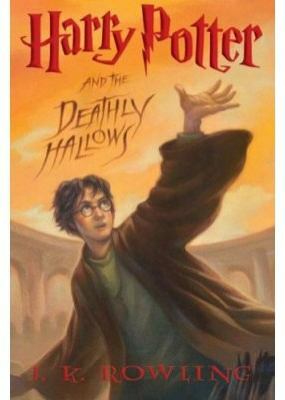 People have died in the series before this book, but there more deaths in this book then in any other book. Did you expect that many people to die? Who were you most disappointed to see die? Was there too much violence for a children’s book? Is the language appropriate for a children’s book? 9. Was anyone confused about the Horucruxes? How many were made total? Do you think the spells to make them influenced who Voldemort became? 10. Where do you think Harry ended up after he “died”? Harry asks Dumbledore “Is this real? Or has this been happening inside my head?” and Dumbledore answers “Of course it’s happening inside your head, Harry, but why on earth should that mean that it is not real?” (723) What do you think? Were you surprised by the reactions that some people had when they saw Harry in Hagrid’s arms? 11. What did you think of the Epilogue, giving a glimpse into everyone’s lives nineteen years later? Did you want to know, or would you have rather guessed at what happened? Did things turn out the way you expected? This Friday Feature post continues my process of posting all the questions that I developed for a set of book discussions based on the Harry Potter book series. 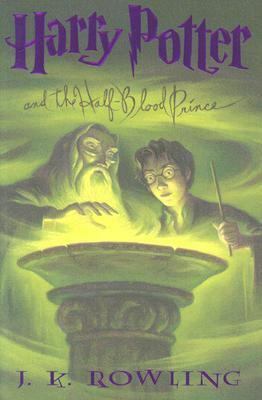 Today, I’m featuring Harry Potter and the Half-Blood Prince, the sixth book in the series. I was very careful when drafting these questions to avoid going into too much detail about the horcruxes, since some of them are left for the seventh book and readers still have questions at the end of Harry Potter and the Half-Blood Prince. How does his attitude towards fame compare and contrast to Harry’s and Professor Lockhart’s attitude? What do you think J.K. Rowling is trying to say about fame when she portrays it in these different ways? Why does Slughorn want to surround himself with wizards he thinks will become famous, and what does he stand to gain from these relationships? 2. Why do Ginny, Hermione, and Mrs. Weasley dislike Fleur? Do their opinions of her change by the end of this book? 3. Luna tells Harry that she enjoyed the D.A. meetings because “It was like having friends.” (138) Do you think Luna is lonely? Do you think she acts the way she does on purpose? Why or why not? Would you want Luna as a friend? 4. Is Dumbledore right when he says that since he’s “rather cleverer than most men, my mistakes tend to be correspondingly hunger.” (195) Do you think that applies to everyone? Are there other attributes besides cleverness that could affect the ramifications of a mistake? 5. Should Ron have become the Keeper for Gryffindorf? Should Hermione have cast a spell on McLaggen, the other person trying out for the Keeper position? Was Harry right in tricking Ron into thinking that he’d drank the lucky potion? 6. Dumbledore keeps putting off answering Harry’s questions about his whereabouts. Do you think he should have told Harry sooner? What did you think about Dumbledore inviting Harry along on his missions and searches for the Horcruxes? 7. Dumbledore asks Harry if he feels sorry for Voldemort. Do you feel sorry, or at least differently, about Voldemort after hearing about his upbringing? If you were Harry, would you admit it if you did feel sorry? 8. We see a lot more romance in this book that in previous books. Tonks and Lupin at the end of the book, Bill and Fleur are engaged, Hermione asks Ron to be her guest at the Slug Club party but then takes someone else to make him mad, and Harry finally kisses Ginny. Was Ron a coward for not making the first move? When did you suspect Ron and Hermione and Harry and Ginny might have liked each other? Did you ever think Harry and Hermione would end up together? Was Harry right in worrying about their friendship? 9. Should they have closed Hogwarts? Would you have wanted to attend Hogwarts with everything that was going on during that time? 10. Dumbledore asks Harry “If Voldemort had never heard of the prophecy, would it have been fulfilled? Would it have meant anything? […] Do you think every prophecy in the Hall of Prophecy has been fulfilled? […] The prophecy does not mean you have to do anything.” (510-512) How would you respond to these questions? Do you think the prophecy predetermined Harry’s and Voldemort’s actions? 11. Were you surprised that J.K. Rowling killed Dumbledore? Were you surprised Snape was the one that killed him? Were you surprised that Harry’s suspicions against Snape and Malfoy finally proved right? Should Harry have kept the good luck potion for himself? Discuss. This Friday Feature post continues my process of posting all the questions that I developed for a set of book discussions based on the Harry Potter book series. 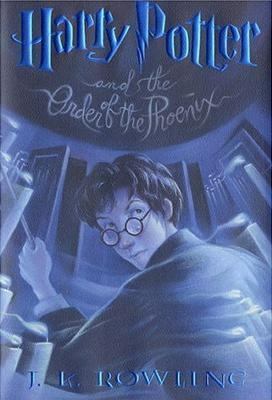 Today, I’m featuring Harry Potter and the Order of the Phoenix, the fifth book in the series. It’s with this title that we started to lose people. Maybe it was the timing (the discussion took place just after July 4th) or maybe it was because it was geared towards older kids, or maybe because it’s the longest book, clocking in at a whopping 896 pages. In any case, we only had twenty people show up, which is obviously still a good showing for a book as long as it is. One thing that I want to note here is that the kids were really interested in talking about the snake’s attack of Arthur Weasley and also what happened to Sirius, which I hadn’t wanted to breach because of how things play out in future books. However, we did discuss those two scenes briefly, and I would encourage other librarians to incorporate them into their own discussions. 1. Harry saves Dudley from a group of dementors at the beginning of the book. Why do you think Harry stops the dementors? What would you have done in that same situation? Do you think Dudley thinks about magic differently now that he’s been on the receiving end? 2. Professor Umbridge takes over teaching Defense Against the Dark Arts and refuses to allow the students to actually perform the spells, insisting that “As long as you have studied the theory hard enough, there is no reason why you should not be able to perform the spells under carefully controlled examination conditions.” (244) Is she right? Do you think your teachers would agree with this philosophy? What do you think about this method of teaching? 3. Harry receives detention from Professor Umbridge repeatedly for talking back to her. Why is it so difficult for Harry to hold his tongue? Do you think Harry should have told someone about her form of detention? What other forms of detention have we seen throughout the series, and how do they compare to her tasks? 4. Why doesn’t anyone want to listen to Harry when he tries warning that Voldemort has returned? Should Harry have tried harder to convince people? What reasons do people give for believing or not believing him? 5. Harry does not initially want to be a teacher for Dumbledore’s Army. Why is he so opposed to the idea to begin with and do you agree with his reasons? (327-328) Why do you think so many students joined the DA, even though most of the school doesn’t seem to believe Harry? Does naming it the DA cause problems later on, and do you think they would have gotten in so much trouble if they’d named it something else? 6. Percy tells Ron to avoid Harry, and sends back the Christmas present he receives from his family. Why do you think Percy is distancing himself from the family so much? What do you think he hopes to accomplish while employed with the Ministry of Magic? 7. What do you think of Dumbledore assigning Snape the job of teaching Harry Occlumency? Do you think Harry would have done better or worse if someone else was teaching him how to defend against mental attacks? Could Snape have done a better job teaching Harry? Would you want anyone to have that ability or would you want that ability yourself? 8. How are Fred and George different from and the same as the rest of their family members? What do you think of their plan to open a shop of gag gifts and trick items? Should they have stayed in school? 9. Ron is amused by the concept of skiing, Professor McGonagall calls the fist-fight “Muggle dueling”, and Ron’s mother is outraged when the doctors experiment with stitches. What other Muggle things would be hard to explain to wizards? Would you be able to explain why we do those things or how they work? 10. Should Dumbledore have told Harry about the prophesy sooner? How much control do you think Harry has over his own life, and how much of it has been predetermined? Are your actions determined by your belief of what’s going to happen in the future? Does that knowledge change how you act? This Friday Feature post continues my process of posting all the questions that I developed for a set of book discussions based on the Harry Potter book series. 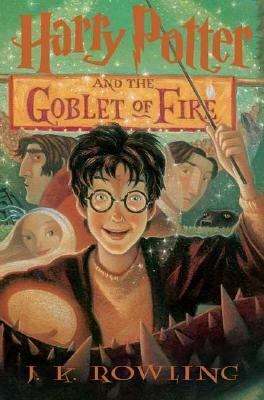 Today, I’m featuring Harry Potter and the Goblet of Fire, the fourth book in the series. First I addressed the discrepancy between the first print and subsequent printings of this book. I read the scene where Harry’s parents come out of his wand, which with the hardcover is on page 667. What order do Harry’s parents exit the wands (who has James coming out first and who has Lily exiting first)? Which way is the right way? J.K. Rowling explains it on her website that the order should have been “Lily first, than James. That’s how it appears in my original manuscript but we were under enormous pressure to edit it very fast and my American editor thought that was the wrong way around, and he is so good at catching small errors I changed it without thinking, than realized it had been right in the first place. We were all very sleep-deprived at the time.” It was fixed in later printings. I did this so that everyone was on the same page as to who was supposed to come out first, in case it came up during discussion. 1. Goblet of Fire is not the longest book, but it is much longer than the first three. Do you think J. K. Rowling could have cut something out to make it shorter? If so, what would you have cut? Do you think the length of this and future books discourage some kids from continuing the series? Do you think some kids shouldn’t read this book, and why? 2. As Harry grows up, his world expands. In Goblet of Fire, Harry becomes more aware of the international wizarding community than he has been before, and we finally learn about other schools like Hogwarts. What differences and similarities (for instance, in dialogue and appearance) are there between the students from each school? Do these characters change how you imagine the wizarding world? Where do you think these schools are located and do you think there are still more schools that we don’t know about? 3. After the Quidditch Tournament, people started celebrating and then things turned ugly. Why do you think they started harassing the Muggle family? Why do you think the Death Eaters choose that moment to come out of hiding? 4. Hermione makes a comment during the riots that Ludo Bagman is “not exactly on top of things” and Ron brushes her off by saying “He was a great Beater though.” (127) Are there other times in the story that things don’t really add up, yet people decide to ignore what’s wrong or go along with it? Why do you think people were so accepting? 5. Do you like Mad-Eye Moody? What do you think of his teaching methods? Should he be doing the things he does, like turn Draco into a ferret and cursing students? Would you want him for a teacher, and do you think he’d treat you like Malfoy or like Harry? 6. Let’s talk about all the work Hermione does in an effort to improve “Elfish Welfare”. Why do you think Hermione is the only one concerned about their wellbeing? Were you surprised that Hermione couldn’t come up with a better acronym besides S.P.E.W? How do you think the elves feel about Hermione’s efforts? 7. This isn’t the first time we’ve seen Ron stop talking to people he’s angry with, since he did it to Hermione in the last book and now to Harry in this book. Is this the right way for him to handle things? Do you think this is how he acts when his brothers make him angry? Would you rather have someone who is mad at you yell or stop talking? 8. It seems like every Tournament competitor gets help in some way from someone. Were they supposed to get outside help? (Let the kids answer this, then refer to page 281 for official rules, which read “The champions are not permitted to ask for or accept help of any kind from their teachers to complete the tasks in the tournament.”) Do you think it’s fair that Cedric and Harry end up working together, and do you consider that breaking the rules? Do you think the heads of the schools should have been involved in the planning and scoring during the tournament? 9. Rita Skeeter routinely embellishes the stories that she reports. Why do you think she does this? Do you think she’s aware of the consequences of her reporting? Do you think news reporters today do the same thing? 10. Why did Voldemort want to duel Harry? Do you think it was a fair fight? What do you think would have happened if only Cedric had appeared with the Triwizard Cup? Do you think the other wizards would have eventually found out about Voldemort’s return? 11. Why do you think both Cedric and Harry didn’t want to claim the prize for themselves? If the Triwizard Cup hadn’t been a portkey, who do you think should have won, and do you think the other person would have felt bad later? If you had been Harry, what would you have done with the winnings? Do you think Harry is selfless in his actions, and can you find other instances in the book to back up your answer? Next week, Order of the Phoenix!